To me, if you want to smell Australia. It means going into the bush after rain and breathing in deep. What you will smell is the earthy undertones of eucalyptus trees wet from a recent down pour or drizzle. It smells so wonderfully clean. 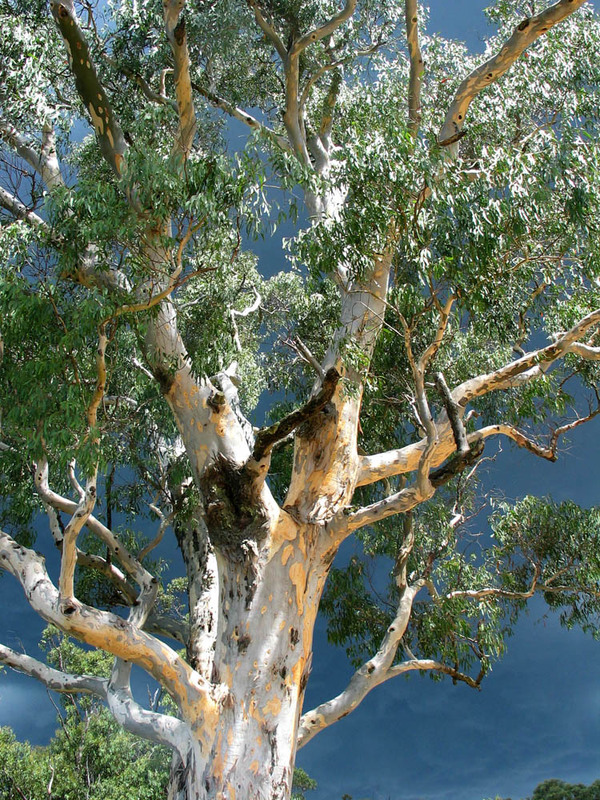 There are hundreds of different varieties of eucalypts found in Australia. However due to them being introduced to all corners of the globe, you will also find them from Egypt to Chile. 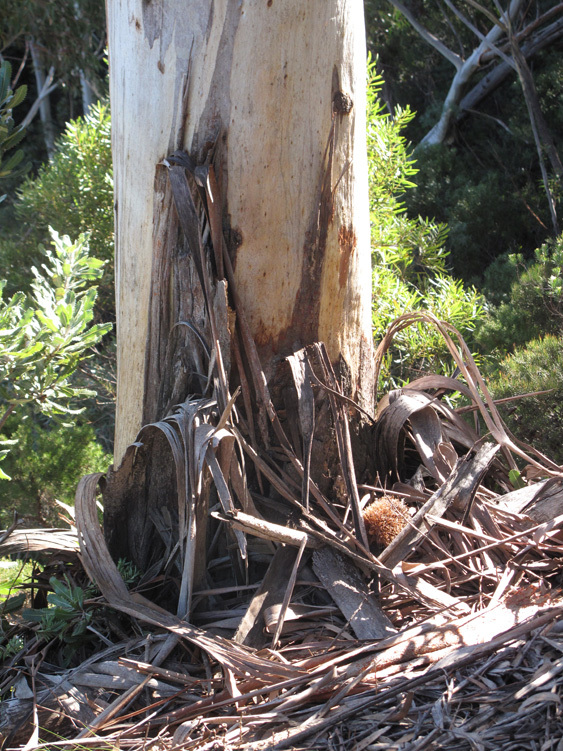 As they have been introduced to some areas that are not suitable for their growth and the fact that they are also large water suckers, not everyone is a fan of the old eucalypt. 1/ Stains in clothing can be easily gotten out with a paste of eucalyptus oil and liquid washing detergent. Rub it in to the stain with some thing like an old toothbrush, leave for 10 minutes and then wash as normal. 2/ Removing remains of anything sticky, eg. wax, sticker. Use oil straight and rub sticky business off. 3/ Feeling clogged? Or perhaps a toilet plunger to suction outgoing mucus sounds like a good idea? Try boiling some water, put the plug in the sink, fill sink with hot water and 3 drops of eucalyptus oil, and drape a towel over your head to breathe the vapours. The eucalyptus oil works as an expectorant and decongestant. DON’T add 2 tablespoons of the oil to the water, as your lungs will constrict and you will be blinded for approximately 5 minutes- you have been expertly warned. 4/ Underarms in clothing having a residual pong (smell)? Try the same oil to laundry liquid paste as no. , leave and wash as normal. No residues from under arm body odour or deodorant build up. 5/ Freshens and deodorises anything that may need a little lift. 6/ Feet looking a little funky with a touch of athletes foot? Try soaking the foot in a bucket of 1 part vinegar/ 3 parts water, dry and then dab straight eucalyptus oil on to the infected area. Eucalyptus oil works as a fungicide. It can also be used straight on any discoloured nails that may have a fungal infection. 8/ For dust mite control, add a cap full to your washing machine and wash sheets and mattress protector. Soft toys can also be washed in this way. This kills the dust mite and removes the allergen that the they produce which can effect asthmatics. 9/ Insect bites can be treated with dab of straight oil. eg. Mosquito or tick bites. 10/ When cleaning out cupboards. Get a 1/4 bucket of hot soapy water, with a cap full of eucalyptus oil, and wipe down shelves for clean and fresh smelling. See here for 10 Tips on using Bicarbonate Soda. This entry was posted in Going Green and tagged clothing stain removal, environment, eucalyptus oil, green cleaning tips, Making, Creating + Frugal Living, natural methods for cleaning by cityhippyfarmgirl. Bookmark the permalink. I think this was the main ingredient in the cure all ointment that my grandma used to dab on us when we were kids with insect bites etc. There is one of these trees in the garden opposite me, far from home eh? I love reading the multi purpose tips from natural & non harmful ingredients. Eucalyptus has some serious power in its oil doesn’t it! I too love the smell of the bush just after rain, nicely put…. pure Australia. It is Anna, pure Australia to me too. That earthy wet smell, eucalypts still dripping- ahhh, I think I need to go get my akubra and driazbone, and sing waltzing matilda now. Ooooh! I love Eucalytus oil. The smell is divine. Some of these tips are new for me. Thanks! I love using eucalyptus oil for removing sticky residue and household cleaning. I now have a few more uses for this wonderful oil. Underpit clothes soaking and nasal decongestant. ten tablespoons with a sink of water. got it. Nice to see…read you again Amy- you’ve been missed! Ten tablespoons, eek could you imagine? It wasn’t pretty when I did 2 tablespoons. Actually it makes me laugh that through my own clutzy-ness I blinded myself. we take the eucalyptus leaves, add some oil, stick them in little sachets, and leave them in the corners of our home. many of the things you have listed i have never tried, so good to know. Kristi thats a great idea with the sachets- thanks. Brydie, this is very cool, thank you! I’ve been using a mix of detergent-Eucalyptus oil- vinegar and bicarb since you put me onto it as an all-purpose cleaner – works a treat! Nice to have the dustmite recipe too, thank you! Happy to be of service 🙂 That mixture does work a treat. I love Eucalyptus- the scent, the oil, the leaves. Nothing screams australia like the smell of eucalyptus oil – I love it! Thanks for these tips, I will test them out during my weekend clean! Yeah, the smell of eucalyptus sends me straight back to Australia – wonderful. Great tips. When you talk about oil, do you mean essential oil. Given that we generally get this in 10 ml bottles that cost quite a lot, pouring a capful into the washing machine sounds a little extravagant. Is it another product you are talking about? I do mean the essential oil. I buy it in 200ml quantities, which are fairly standard size here, also a 50ml or 100ml you can buy. I would pay about $9.50 I think for the 200mls (5.50 GBP??) That size would probably last me about 6 months….that would be extravagant using if you can only buy it in 10ml bottles! I had no idea about the stain removal… hot tip! Thanks. One that we use that is a variation on the sink of water, is the bath tub of water. When my kids have a cold, I get them to put the plug into the shower floor (which is like a little bath tub) and pour in a little eucalyptus oil while they are having a shower. And then I shut the bathroom door so the whole room gets nice and steamy and they get a long dose of the oil’s decongestant effect. Good for littlies who won’t hold their heads over a sink. Its good perfume for both body oil and toilet soap. Any idea on how to obtain eucalyptus oil from a living tree? Sorry Dani, not sure about that one. has any one tried just using eucalyptus in a regular shower? if so, what is the best way to get it to work? dish of oil, soaking oil/water into a sponge? I have recently heard eucalyptus can get rid of spiders in the house. I could not tell if it was branches or oil. A man posted that he put eucalyptus outside and inside his tent when camping. Anyone heard of this? I am addicted to eucalyptus oil I use it for all the above plus polishing my wooden furniture, cleaning leather couch, mirrors, shower screens and walls, kitchen benches. I have spray bottles of it mixed with water only in all the rooms of my house so I can just grab it when needed.Amazing stuff. How would you recommend dealing with a spill of eucalyptus oil & water combined onto clothing? Will it wash out with soap/laundry powder? Hi Jennie, not completely sure to be honest. I would try a laundry liquid/powder paste, (ie a small amount of water and the laundry soap), rub it into the area and leave to soak for a couple of hours. Hopefully that should make it come out. Is eucalyptus oil safe to use in steam for Eustachian tube problems if you have a blood pressure problem?